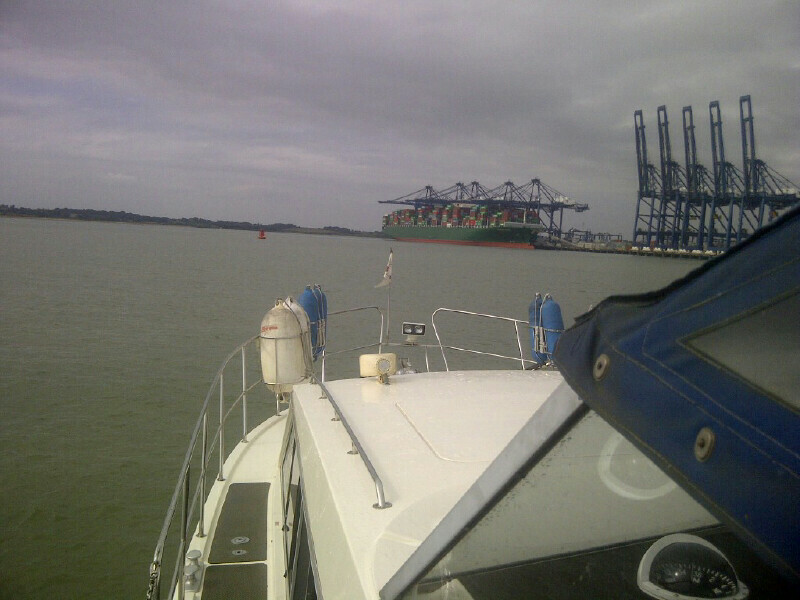 A steady cruise in smooth to slight seas to Ipswich on a well planned basis. Lady Martina behaving very well. On day one, we topped up our fuel at Herbert Wood's yard in Potter Heigham and (just) got under the 11ft 6ins bridge with my windscreens still up; but with everything else down! We cruised on through light drizzle until after Acle Bridge and then put the canopy up as the rain fell again. Once at Yarmouth Yacht Station, the Quay Rangers cast doubts on the lowness of the Neap Tide tomorrow and so, as tonight’s was predicted as 0.9m against 1.1m in the morning, we opted to take advantage of an evening neap low water being better than the morning and went under tonight even through it drizzled quite heavily and wet the bridge and saloon stairs. The airs were still and so we moored up at the Breydon Water pontoon and raised our mast and canopy; mopping furiously and trying to get the dampness down. It was dark by the time we were doing this but we were well moored and ready for tomorrow's early start this evening, drying out, log-keeping and writing and then to bed at midnight thirty ahead of an early start tomorrow. 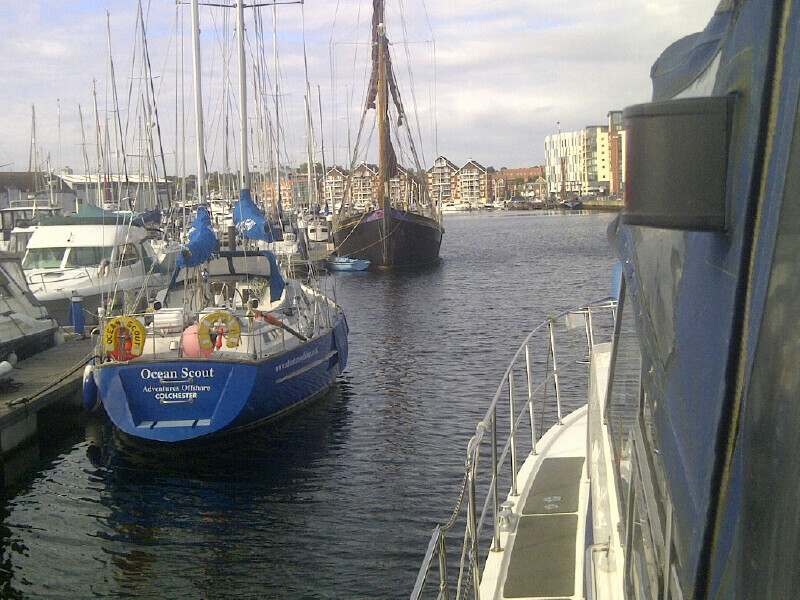 On Day two, the Haven Bridge raised for us as scheduled and we proceeded down the inner harbour with another boat behind and then headed out into the Yarmouth Road and down past Lowestoft where John and all aboard Lady Cathryn joined us for a while. I was content to cruise slowly at not much more that 9knots as we were early on the tide and had an adverse knot or two against us to begin with but Lady Cathryn went ahead and arrived first. The passage from Breydon to Neptune took us about 7 hours at about 8.6knots for the 60-odd nautical miles, using some 122 litres of diesel at a cost of around £150; something like a third of the cost of travelling at full speed. We adopted my usual procedure of logging the boat’s performance and position every half hour and celebrating these landmarks with sandwiches or snacks which both avoided boredom and seas-sickness and Kathleen really enjoyed the experience and took some part on the logging and autopilot operation. I had both the MLR and Raymarine GPS Sat Navs programmed with the course waypoints and, with the former’s waypoint arrival alarm set at around .3nm and the latter at .1nm, we had pre-warning of the event and then the latter heralding the course change that the autopilot needed to follow and it all worked well; apart from the series of quick changes as we arrived in the Harwich channel where I had to manually intervene as out frugality of inserting waypoints would have resulted in us hitting buoys! Throughout, we had the large bridge-mounted monitor displaying our route and course, using MaxSea navigation software running on my laptop in the saloon. 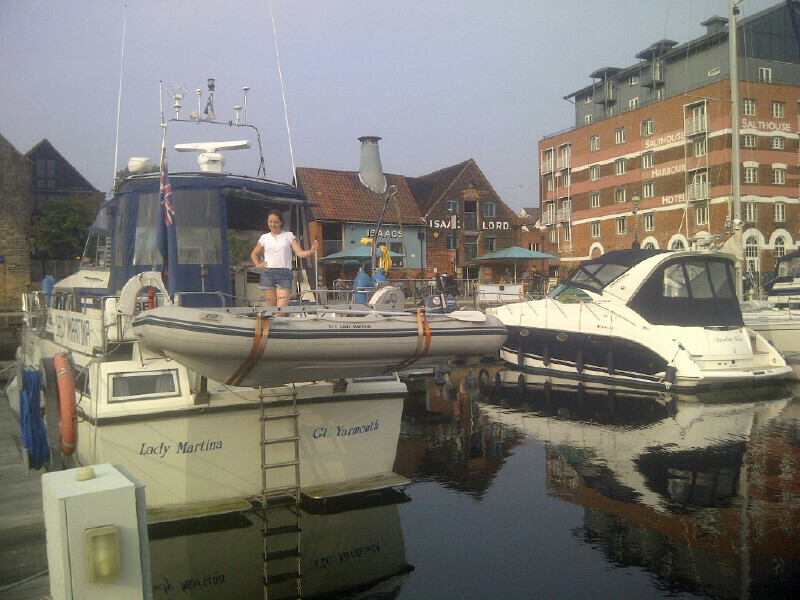 The dock at Ipswich has improved greatly since I last visited over 10 years ago, with many more riverside restaurants, clubs and pubs so that it had become quite a recreational centre and it formed a very pleasant place to stay for a few days. Visit broomowners.com for regional events, members pages and details on how to join.